Known for their sleek contemporary design and exceptional performance-focused features, a Russell Hobbs microwave is sure to become a welcomed addition to your kitchen. Offering the capacity to prepare large family meals in no time at all, our Russell Hobbs microwaves come complete with a number of exciting features including as many as 8 auto programs, intelligent sensor technology and a maximum microwave power of 800 W.
Perfectly equipped to accommodate all of your cooking requirements, a Russell Hobbs microwave will not only allow you to cook your favourite dishes in minutes, but they will also allow you to reheat food. Available in a choice of stylish colours that will complement and enhance both traditional and modern kitchen décor, our Russell Hobbs microwaves really will allow you to tackle all of your cooking needs! 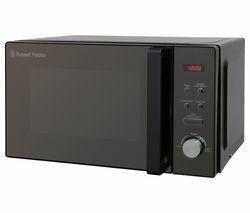 And within our extensive product range, you will find a great choice of models including the Russell Hobbs RHM2362S Solo Microwave – Silver, the Russell Hobbs RHM2064R Solo Microwave – Red and the Russell Hobbs RHEM2301B Solo Microwave – Black. Making cooking easier and quicker, all of the models in this fantastic range feature user friendly buttons, programs and settings that are super easy to grasp! This means the whole family will be able to use your new Russell Hobbs microwave. But that’s not all…a Russell Hobbs microwave also comes complete with an impressive selection of auto cook menus, meaning you will always be able to cook what you fancy, quickly and easily. If you can’t find what you are looking for, don’t worry. 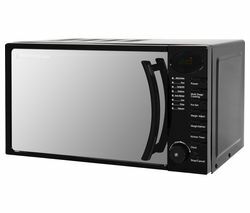 We have worked hard to bring you the very best products from some of the world’s leading brands, so you will always be able to find the perfect microwave for your requirements. With this in mind, why not check out our Panasonic microwaves and Samsung microwaves for more options?